If there's a fifth Indiana Jones movie, Indy might want to use one of the hottest new tools revolutionizing archaeology: LiDAR, or Light Detection and Ranging, which allows archaeologists to survey ancient sites from the skies. "Think of an impressionistic painting, the closer you look at the painting, the closer you look at the painting you see the brush strokes. When you pull away, suddenly it's obviously the face of a woman in a park. You know, your brain can interpolate that stuff better at a distance." Marcello Canuto, an archaeologist at Tulane University. "LiDAR allows us to see these small little features that close up look like little pieces of data that we're not sure what to do with, but when you zoom out, there it is, clear as day." The technology works like radar, but shoots laser pulses instead of radio waves, to 3-D map a landscape. 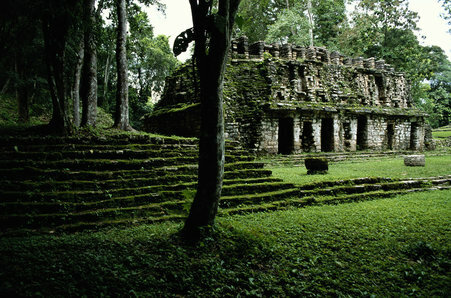 In 2016 it was used to map over 800 square miles of Guatemalan jungle, including the area around the famous tourist site Tikal. Canuto remembers when he and his colleagues first saw the footage. "One hour went into two, went into three. We just lost track of time. It got dark outside, we were just open mouthed, we couldn't believe what we were seeing." What they discovered, after careful analysis, were buildings in areas they'd already excavated. And big landscape-level features, like canals and roads, bridges, ditches and walls. "It was a very humbling moment for all of us. To be able to think, wow, that was under our feet the whole time and we didn't recognize it." Overall, the density of structures suggests a population of somewhere between seven and 11 million people in the region, more than 1000 years ago - which aligns with previous estimates. Nearly 100 years ago, the famous aviators Anne and Charles Lindbergh flew over some of the same swaths of jungle, taking photographs from the sky, partly in hopes of aiding archaeologists. "It was very early appreciated that under the jungle canopy there was a lot to see. If we could only see through the jungle canopy." Now, we can. And it's a foundation, Canuto says, for an entirely new era in archaeology.